Tucked away on the northeast coast of Bali on a remote black sandy beach, Spa Village Resort Tembok Bali provides the perfect opportunity to immerse yourself in peace and tranquillity. Spa Village Resort provides a complete spa and wellness experience with luxury accommodation, wholesome meals made using freshest market produce, indulgent spa treatments, yoga sessions and healthy lifestyle activities. With excellent facilities and fantastic customer service, I was made to feel very special during my entire stay. 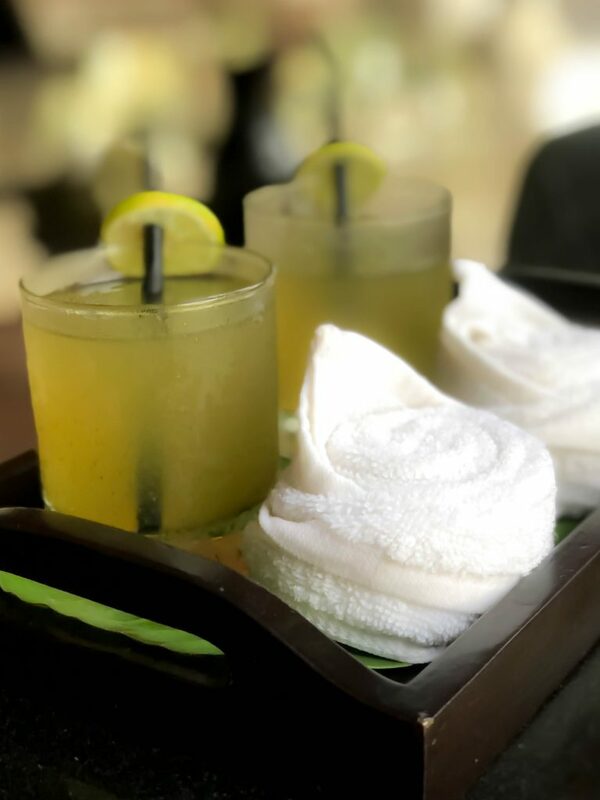 Read my full review of the hotel here; this post is focussed on Spa Village Resort, Tembok Bali incredible spa facilities. The fantastic location of the resort, away from the hustle and bustle of city life and the black sand plays a key role in the spa rituals. On the day we arrived at Spa Village Resort we had our treatments booked in the evening just before dinner to completely de-stress after the long journey from London. Our spa robes, bag and slippers were ready in our room, so we changed and made our way straight to the spa which overlooks the beautiful garden of the resort. We were welcomed by our spa therapist who explained us about the treatments and led us into the treatment room. 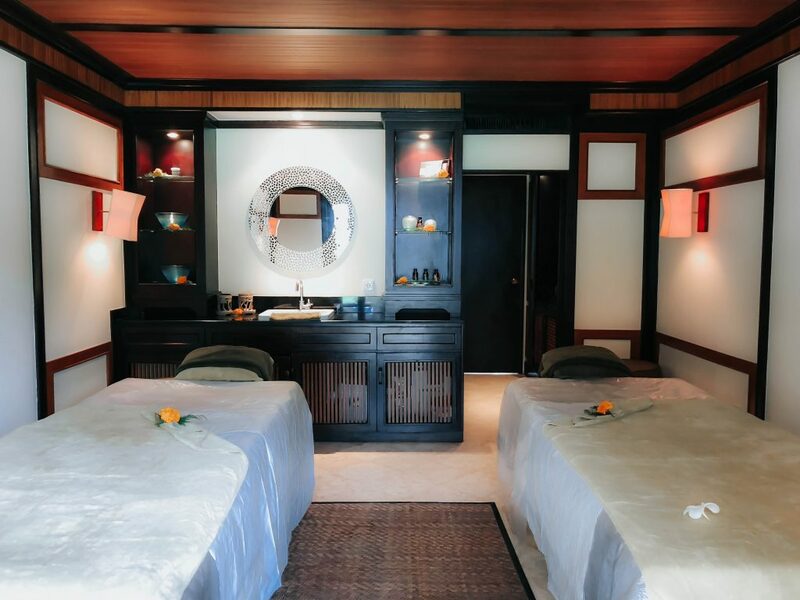 The décor of the spa had a luxurious yet traditional Balinese feel. The treatment room was spacious, and the beds were heated and very comfortable. The room had the perfect temperature with calming music to soothe the mind and body. 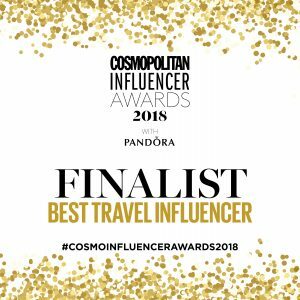 I was excited for my first treatment which was the 50-minute Natural Facial, and my husband was looking forward to the 50-minute Balinese massage. The facial began with the therapist wrapping my hair with a headband to keep the product away from my hair then my face was cleansed using a cotton pad to get rid of my makeup. My face felt squeaky clean after the cleansing ritual, and then an exfoliating scrub was applied which rubbed away all on the dead skin cells. Once my skin was exfoliated, the facial moved on to my favourite part which was the Balinese facial massage using mini floral pouches. I noticed quite a different massage technique used by the therapist that felt incredible invigorating. 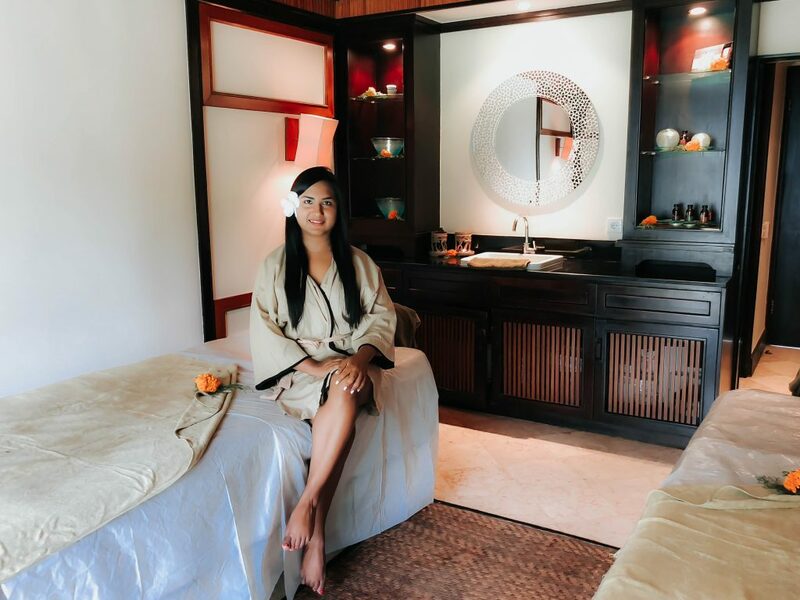 The facial continued with a face mask made of local herbs like Kayu Cendana (Sandalwood) and tamarind leaves which I believe helped to produce a youthful glow that I had never experienced after any of my facial sessions before. While the mask was drying, the therapist massaged my arms, shoulder, head and legs which relaxed me entirely and I almost dozed off. My mask was washed away using a hot cloth which produced steam that also acted as an excellent hydration technique to lock the moisture with cream afterwards preventing the moisture to evaporate. The facial immediately increased the blood and oxygen flow and therefore producing the youthful glow I mentioned above. To complete our treatment, we received Jamu drinks which completely revitalised us. After the fantastic treatments when we reached our room, our bath was decorated with rose petals and candles which uplifted our mood and helped us get ready in style for our first-day dinner at the resort’s Wantilan restaurant. On the second day, we opted for the Spa Village Pre-treatment Ritual: Segara Giri (30 minutes) and the Spa Village Experience: Timun (Cucumber Aloe Body Wrap) (50 minutes) and Balinese Massage for my husband. I was looking forward to this treatment as in the Balinese language Segara mean Ocean and Giri mean Mountain; this was a prelude to our spa treatment. Based on the local belief that feet act as a conduit between the energy of the earth and the self, this ritual used the mineral-rich black volcanic sand to cleanse and steam the feet and is considered a way to purify the individual. This treatment took place in an indoor patio with an open sandpit where we were asked to put our feet in the volcanic sand to steam our feet. It was getting quite hot, so in between the treatment, we were given crushed ice cubes with palm sugar syrup which helped to cool us. After the steam, we were asked to wear our robes and get ready for the wrap. 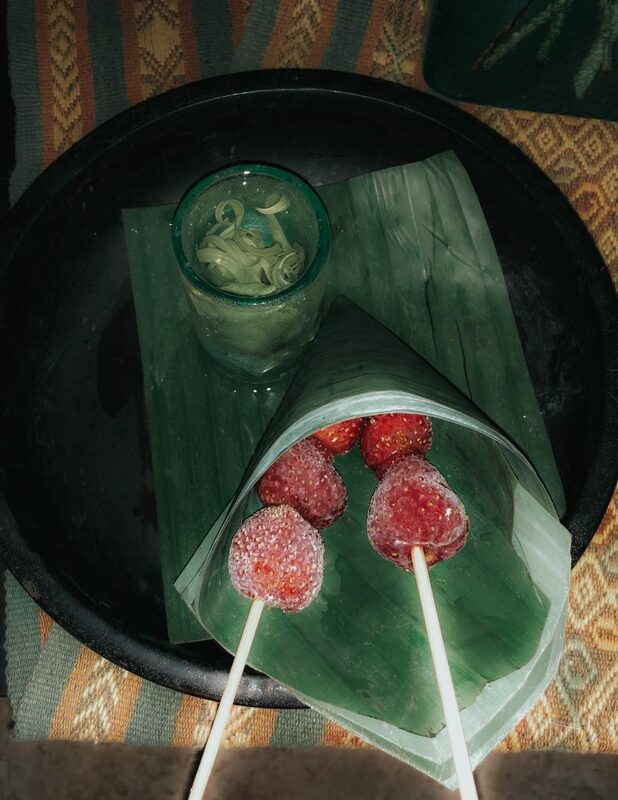 Just after the steam, we received frozen strawberries and ylang-ylang essence water which felt energising. I was well ready for the 50-minute Cucumber Aloe Body Wrap, and my husband for his usual Balinese massage. The body wrap was an anti-inflammatory treatment recommend sun-sensitive conditions which were great for me considering I was suntanned after spending long hours by the pool and the sea. During the wrap, I received a head massage, and the therapist made a cute plait on my hair. After the wrap, I went for a shower in the spa. This treatment was also completed by a jamu drink which just felt so relaxing as always. On the third day, I opted for the Balinese massage with my husband. The great thing about our spa treatments was that we had all the treatments together which meant none of us had to be alone for few hours. I had already learned from the spa brochure that the massage combines historical reference from many cultures, especially Indian, Chinese and European influences, which form the foundation of Balinese traditions. I am someone who hardly gets satisfied with a massage so I was hoping the Balinese massage would be able to live up to my expectations. By this point, I was becoming a pro in spa etiquettes, so I got ready and lied down on the spa bed, and then the massage began with the therapist asking me what kind of pressure I preferred and the which sections I would prefer her to focus. I loved the aromatherapy oil used for the massage which was designed to balance and invigorate my senses. I could say the therapist was highly trained in Balinese massage technique as she was successful in finding all my knots and reduced my body stiffness. 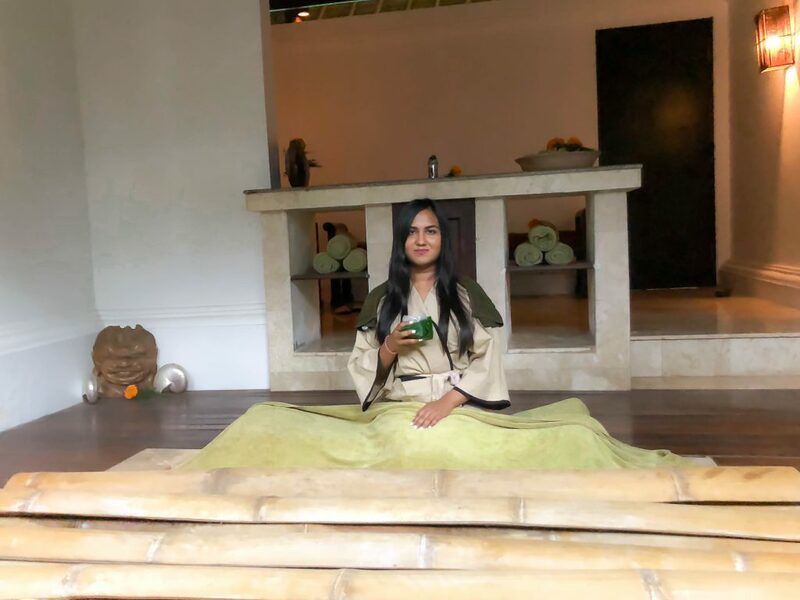 As this was our last day and last treatment at the spa, it made me so relaxed and rejuvenated that it prepared me for our second leg of the Bali trip. The whole experience really made me fall in love with the Balinese massage, and I can highly recommend to everyone. 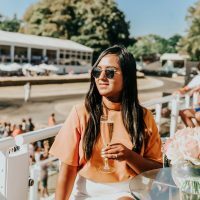 This experience made me realise the benefits of spa and wellness. I could almost feel like my body and mind was reset, and I could go on and take the stress of London lifestyle. No wonder the guest list of Spa Village Resort, Tembok Bali includes celebrities like Keira Knightley and Bellamy Young.